Gaurav Gupta created a world of fantasy, sculpted structures and silhouettes for the grand finale of Lakmé Fashion Week Winter/Festive 2015 at Mehboob Studios. Bollywood actor Kareena Kapoor Khan added grandeur and glamour to Gaurav’s creations. 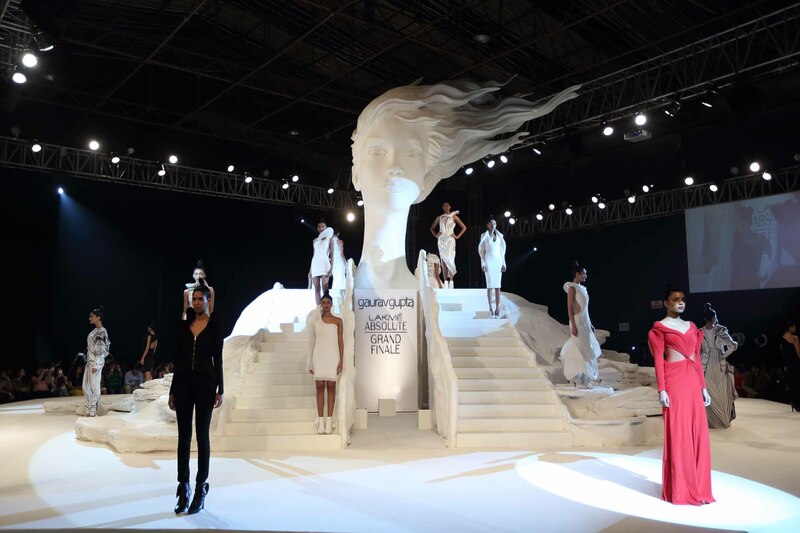 The stunning show had a magnificent white giant sculpture of a gorgeous women rising from the centre of a circular stage around which the spectators were seated. A flight of stairs amongst the white stage décor created the mood for a breath-taking opening. Couturier Gaurav Gupta’s designs were were minimal yet vibrant with moondown gray, albatross black, showtime ivory and reminiscent red. The silhouettes, colours, embroidery and sculpted fabrics were just breathtaking. Gupta’s models strutted down the runway with well-defined matte and crème lips in a stunning palette of rich plums, deep reds and feminine pinks from the new Lakmé Absolute face collection.